About a decade ago I started a “spool” of the comments I had been making on my personal website (which had been running since the late 90s – I actually started editing web pages in 1992, for IBM’s Person to Person product). It became a regular feature, and I decided I needed to manage it more competently so used a handy website by Pyra Labs called Blogger which I moved to. The rest, as they say, is history. 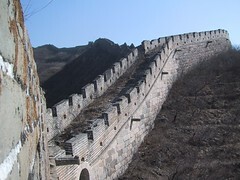 Back in those early days, I wrote an essay describing two visits to the Great Wall of China. It still seems to bear relevance to several things that continue to hold my interest, so to celebrate a decade of “blogging”, I’ve moved the article – Modern Hero – to this site along with some of the photos I took back then. I hope you enjoy it.